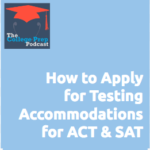 It’s possible to receive accommodations on the SAT & ACT for students with physical or learning differences. However (and this is a super important point for families of these kinds of students): you need to apply in advance. Both SAT & ACT have tried to make the process easier, but unfortunately not all families know this is an option. 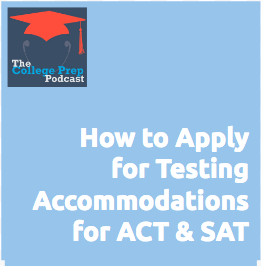 Listen in as Megan breaks down common issues related to applying for accommodations on standardized testing. Then, for more information, check out an article she wrote on the topic!